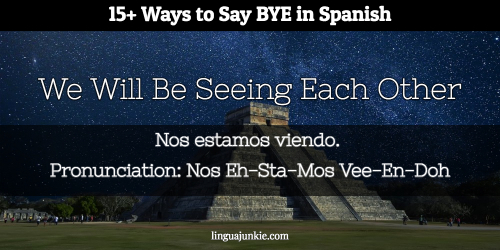 August 14, 2018 by The Junkie 0 comments on "15 Ways to Say Bye in Spanish (Audio Inside)"
I’ll give you more. 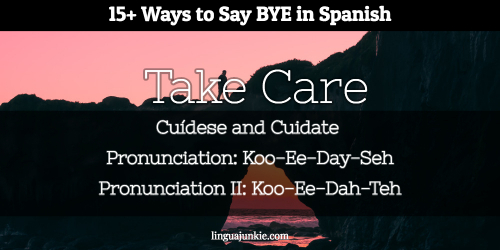 In this guide, you get 15+ ways to say bye in Spanish. There’s even an audio lesson to help you hear real Spanish. 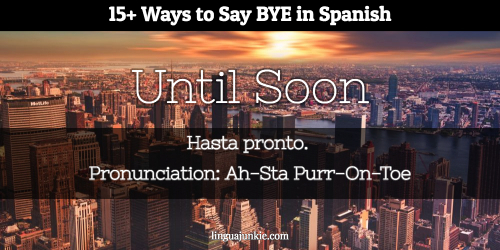 This is the best way to say BYE in Spanish. Every Spanish speaking person will understand this. You may use this word to say bye in any kind of situation such a family reunion, at work, after meeting with someone, etc. 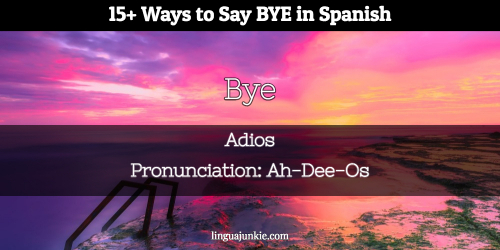 By saying “adios”, you will never go wrong in saying goodbye in Spanish. By the way, want to hear real Spanish pronunciation? Yes, you probably do, if you want to speak it. Just press the play button on the player below. This lesson came from SpanishPod101, a Spanish language learning program and website. 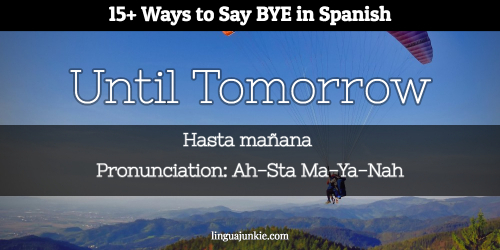 Click here to visit SpanishPod101 for more fun & easy lessons. This is used in some Spanish speaking countries to informally say bye. And you will be seeing it a ton in this guide. 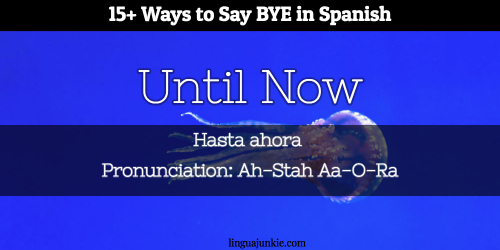 Now, the phrase “Hasta Ahora” is not really used around in the Spanish speaking community, but do not be surprised if someone says bye by saying “hasta ahora”. This phrase translates to “until later” in English. You can say this when you know you won’t be seeing a certain individual or group of individuals until another time not being tomorrow. You may use this phrase on anyone you think you won’t be seeing anytime soon but not sure when you’ll see them. After hanging out with your family who lives five hours away, you may depart by telling them “hasta luego”. 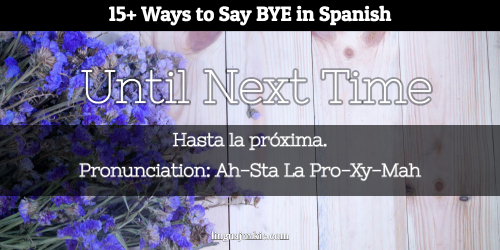 “Hasta la próxima.”- This phrase translates to “until the next one” or “until next time” in English. 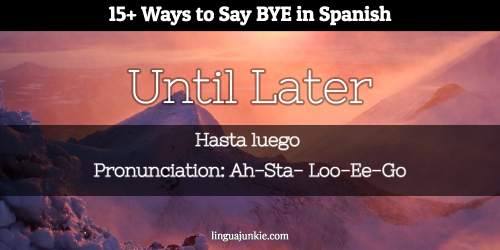 It has a similar meaning to “hasta luego”. After spending the holiday with your distant family, you may say bye to them by saying “hasta la próxima”. This would be an indirect way of saying goodbye in Spanish. This one is very similar to “cuidese” except you are addressing more than one person. So, it is plural. 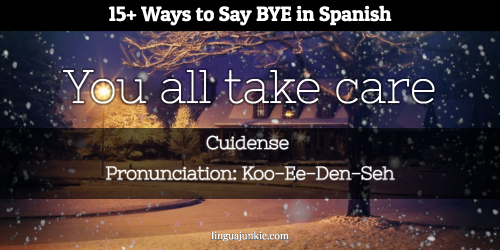 “Cuidense” with an “n” translates to “take care” but the meaning is “you all take care”. After hanging out with a group of people at a restaurant, you may say “cuidense” to say bye to the whole group at once instead of addressing each and every person. This phrase literally translates to “until soon” but the idiomatic translation is “see you soon”. This phrase is perfect for any situation in which you are not sure when you’ll see a particular person or persons, but know it won’t be long until you see them again. If you are use to seeing your mom once a week, you may say bye to her by saying “hasta pronto” because you know you plan on seeing your mom the following week to come. This phrase translates to “we will see each other soon”. It is commonly used around Spanish speakers. It is an informal way of saying goodbye to anyone. 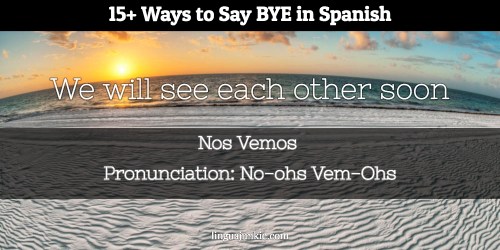 You may use “nos vemos” among old friends or even co-workers. This phrase translates to “goodbye for the last time”. It is a very sad goodbye especially if you are parting from someone you once truly cared about. “Hasta siempre” may be used on a last goodbye to a friendship or even a boyfriend/girlfriend. So, if you wanted a bitter way to say goodbye in Spanish, this is it. This phrase translates to “I will you see you later”. You may use this as a form of saying goodbye when you know you will see someone later in the day. A great example would be your husband or wife. 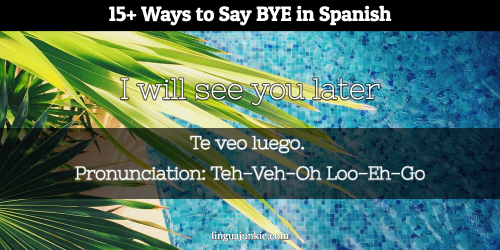 When you are headed to work, you may say bye to them by saying “te veo luego”. This phrase literally translates to “we will be seeing each other” but means “I will see you around”. This is a perfect phrase to use if you are a college student who lives on campus. If you leave your roommate before heading to your own class, you may say bye to your roommate by saying “nos estamos viendo”. 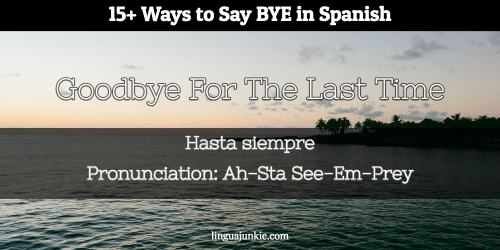 This phrase translates to goodbye in Spain! It is commonly expressed around Spain. It is not heard of much of anywhere else because it is a word that started in Spain. 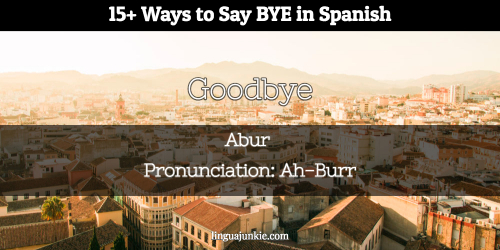 Another word associated with “abur” that also means bye is “agur”. It is common in places like Puerto Rico. So, do not be alarmed or surprised if a Spanish speaking native does this to you. It is culturally common and okay. You may say bye to your grandmother by kissing her on both cheeks. 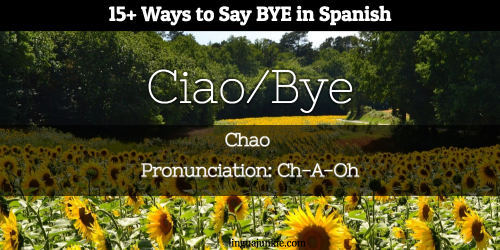 Now you know a whole bunch of ways to say bye in Spanish. The best way to use this “lesson” is to print out and review it every now and then. You learn faster when you review often. P.S. If you want to speak Spanish… and are looking for some quick, easy lessons, check out SpanishPod101.com. Previous Previous post: 15+ Fluent Ways to Say I Love you in Spanish. Phrase Lesson.